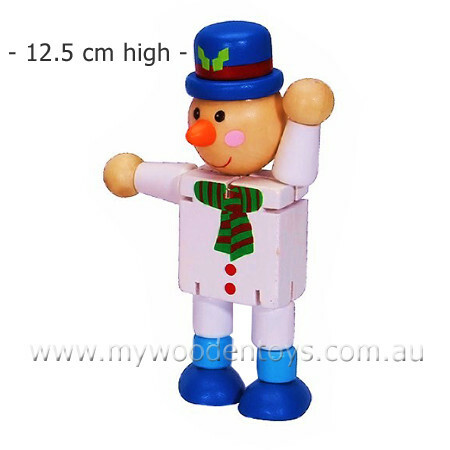 Christmas Wooden Bendable Snowman is a fantastic little fiddle toy ideal for a Christmas stocking. This flexi Christmas toy is all held together with elastic so you can twist and turn his arms and legs and put him in all sorts of positions. The elastic is connected to the body so you can't lose any of the parts. Bendable Snowman can end up in all sorts of positions and is really fun to fiddle with. Very solid with heavy duty elastic this toy will last well beyond Christmas day. Material: Wood childsafe paint, elastic, felt. We like this because: "Lovely blue hat. "